Yakitori is a popular dish of Japanese skewered grilled chicken. In Japanese, yakitori literally means grilled chicken. "Yaki", means to grill and "tori" refers to chicken. However, there are many different types of yakitori, and is not limited to only chicken. For example, grilled vegetables, vegetables with meat, offal, and other types of meat or food served on skewers can also be referred to as yakitori. Yakitori negima is just one type of yakitori skewer which includes Welsh onion, or negi in Japanese, and chicken thigh meat or breast meat. It is a very popular yakitori dish and one that is often found in yakitori restaurants or izakaya (tapas style restaurants). As far as the seasoning is considered, there are basically two types of flavor profiles for yakitori. It is either seasoned with salt (shio), or yakitori sauce (tare), as it is known in Japanese. The tare sauce is made from a mixture of sake, soy sauce and sugar. 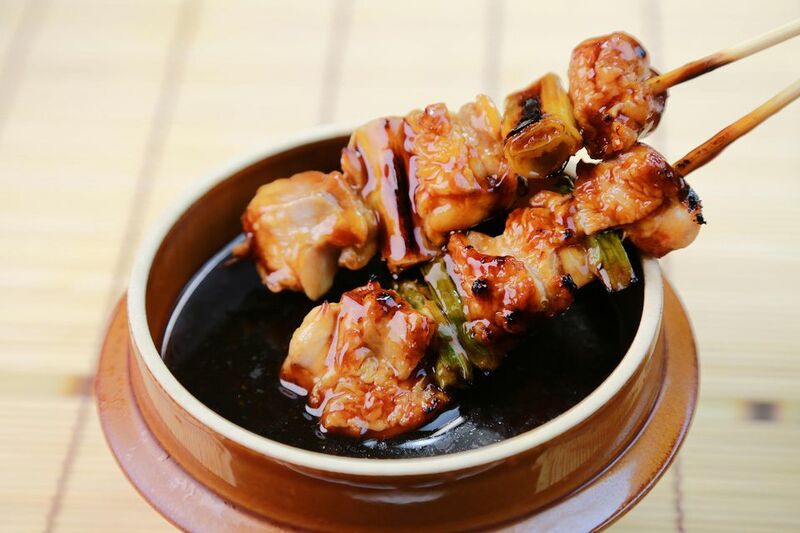 Yakitori can be enjoyed as either a meal or appetizer. Brush for applying yakitori sauce to the chicken and scallion skewers. Soak the bamboo skewers in a shallow dish of cold water for up to an hour, or soak the skewers the night before. This will prevent the skewers from burning when the yakitori is grilling. Prepare chicken into bite sized pieces. Cut the scallion (negi) into large bite sized pieces. Skewer the chicken and scallions, alternating them on the bamboo skewer. Set aside. In a small sauce pan, mix together sugar, sake, mirin, and soy sauce and stir well. Although optional, I highly recommend adding a slice of fresh ginger for more robust flavor. Over high heat, bring the sauce to a boil, then reduce heat to low and gently simmer the sauce until it slightly thickens. Remove from heat and set aside. Next, prepare a hibachi grill or BBQ with hot coals. Grill the skewered chicken and scallion over hot coals until the surface of chicken turns white and appears cooked on the outside. Brush the skewered chicken and negi with the sauce. Grill until cooked through, and brush the sauce over the skewers a couple of times as it cooks.